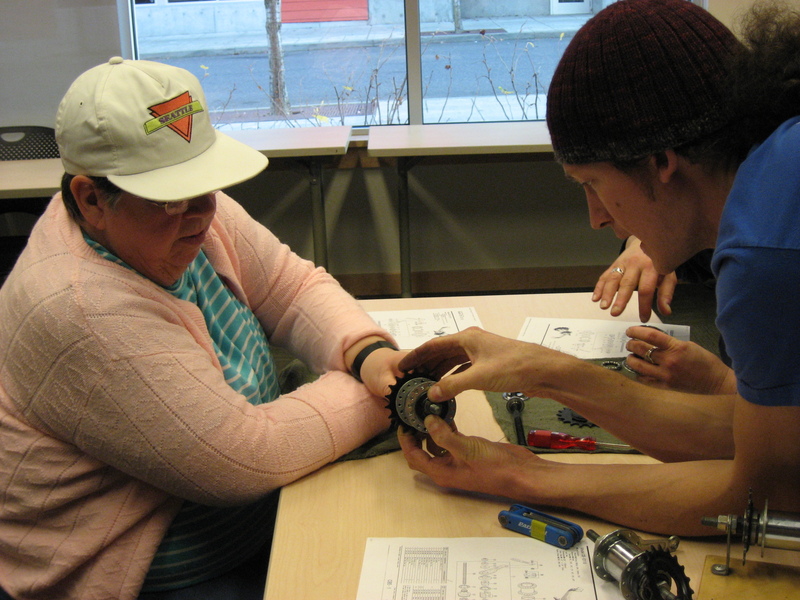 The cold weather may have driven many people inside, but the members of We All Can Ride used it as a chance to learn the nuts and bolts of bike repair. Linda, Doug, Michelle, and Yvette spent the better part of an afternoon – first watching and then doing – at a recent brake repair clinic. 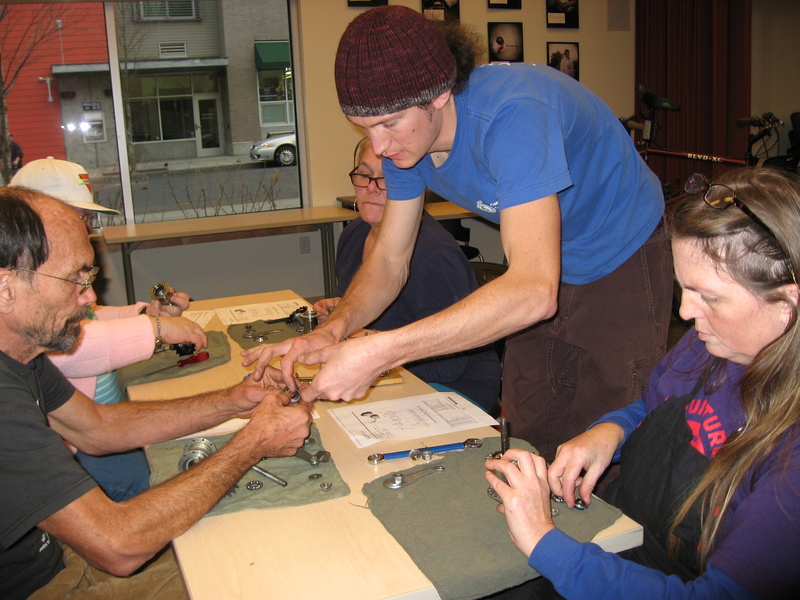 With help from Forrest, a mechanic with the Community Cycling Center, they were introduced to all the ways a bike brake can go bad. After reviewing the basic brake adjustments they learned in their previous training session, the team dove deeper into the braking system. Terms like “caliper”, “ferrule”, and “cantilever” were tossed around as Forrest taught them how the distinct parts work together. Next, everyone sat down for the hands-on portion of the clinic. Each person had his or her own hub to take apart. By viewing a cutaway model of a hub created by Evan at the Cycling Center, they had a chance to see how it worked from the inside out. Once all of the parts were separated, they were asked what problems they might see and how they would fix them. The next task was to put all the pieces back together and then do it again. It felt a bit like a jigsaw puzzle and that’s exactly what Linda thought. As a child she worked with her father to take a vacuum cleaner apart and put it back together. She plugged it in, turned it on, and it still worked. Linda remembered the pleasure it brought her. Spending time in the Bike Repair Hub reminds her of those days. Linda talked about how she enjoys learning new things. “I like to teach kids how to take care of their bikes. We teach them about tires, air pressure, using a pump, and how to use a gauge.” Taking her knowledge to the next step by learning brake repair means that she can pass that information along to them, too. The bike clinics are just one of the many ways the members of New Columbia can achieve their goal of becoming more self-sufficient. Everyone in the community is welcome to participate and they don’t need to be a mechanic. During their next session, the group plans to continue diving in to the world of brake adjustments and replacing brake pads.